"You are always so friendly and respectful." Not sure if the other drivers spoke English but their glares at me as I pulled out needed no translation. I just gave them a big smile and a wave. My FL has the DT-12 and I love it. I find it much easier to back smoothly than with the 10 speed A/S. Last month my truck was in the shop for almost 2 weeks so I had a rental 2019 International LT with the Cummins and the auto shift 10 speed. It did not back up as smoothly as the DT-12,but the thing that really drove me nuts was that it would not skip gears when up-shifting like the DT-12 does, it would go through every one. Never got through red lights unless I was the first few in line. Towards the end I started manually clicking it up to 3rd or 4th and it wasn't so bad. Last week while pulling out of the yard there was a JB Hunt Intermodel truck pulled off to my right. The "heavy set" gentleman climbing out was wearing baggy sweat pants, and apparently nothing else underneath. As a result I was treated to a view of the rare 1 PM "full moon". You can't un-see something like that. A little part of me died that day. If you do decide to move have you ever considered Ryder? I started with them in April and their benefits are very good. Much like the ones I had in my previous career with a major financial services firm. I don't have their heath-care numbers it front of me but when I was looking at my enrollment info they looked very reasonable, I just don't need it from them. The jobs/pay they have available depends on the account you are on. I am on an auto parts account and I love it. Guarantee of $1325/week and the most miles I have done in a week has been 2800 and I am out a most 3 nights a week. Ryder operates a little different than your typical freight company since basically everything is dedicated accounts. The logistics on dedicated accounts can drive you nuts. For the last 5 weeks I have started my week with the same trip that I start tomorrow. Around 1 in the afternoon I will leave Cincinnati with an empty 53 footer and drive to near Tupelo, MS and take my 10 hour break. In the morning I make 3 pickups that are pretty close together and head home, getting back around 9PM. There have been times when all 3 pickups would fit into a pretty small box truck. A lot of diesel burnt up hauling air. I completely understand. I am constantly questioning my dispatcher about logistics on our loads. It sometimes drives me crazy, but I do what they want. If it were solely up to Knight Transportation, we'd be doing it differently, but SAPA pays them well to do it the way they request it. Wondering if there are more companies that offer CDL training that are not listed. Hello again, As stated in the title, I'm wondering if there are any carriers that offer CDL training? I've researched and applied for all the ones listed that I like but am not making much headway. So please if you know of any that haven't been added to the list let me know. Also, my top pick is Millis Transfer so any tips, recommendations, or advice would be greatly appreciated. Have you called Millis yet? I went through their school and I was signed up for a class within a few hours of calling them. Floating Gears at my new job. Can't say I have any advice but I just started floating gears last week about 30 years after I first leaned to double clutch. I leaned to drive dump/ready mix concrete trucks back in the 80s at my family's trucking company. My dad was the chief mechanic and after too many blown up transmissions he had a strict "drive it like the manual says" policy and he assumed any failure was a violation of that policy. Since I had to sit across the dinner table from him every night I didn't risk it. Fast forward 30 years and I have made a career change and started driving. First 15k miles was in an auto while training but in Jan I started with a local company driving a 10 speed. Just kept on double clutching until I over did walking while in Las Vegas and injured my knee, something called the IT Band. Knee was tender when I clutched so I said what the heck let's give floating a try. Within a few attempts it was dropping in just fine. Still DC in the low gears if pulling hard and sometimes when down shifting but I'd say I am floating about 75% of the time now. Let's just hope dear old dad isn't rolling over in his grave at my new indiscretion. Of course he always floated when he drove so I guess it was a case of "Do as I say not as I do." Does anyone know the process to get an auto restriction removed from a CDL? I have looked at the Ohio BMV website as well as online and I can't find it spelled out anywhere. I have decided to attend Millis Transfer's school and it sounds like they will be a 100% auto fleet by the time I am ready to go out with a trainer. I really have no plans to move once I go solo but it would be nice to not have that restriction. I drove 10,13 18 etc speed dump trucks years ago, and as I recall I was pretty good, so not too concerned about it coming back. I have access to a relative's construction company fleet and they have several Sterling dumps and Freightliner day cabs all with manuals that I could use to test out. Just wondering if you have to do the entire pretrip/backing/road all over again or if you just need to to a road test. I have started using an on-line place to pick up cheap prescription glasses. There are many but I use a place called Eye Buy Direct. You can get a pair of basic single vision glasses for under $20. Bi-focal and other options add price but aren't really needed for an emergency driving pair. By no means high fashion but they get the job done. I now have extra pairs stashed on my motorcycle and cars. Just ask for a copy of your prescription after your exam. Do Any Of You Get Up This Way? Check your account, I think you have been hacked!!! Some clown is sending out play date requests under your name. What if I only want to drive locally? Look for local Class B and C jobs. As long as you have the right endorsements you can do any of those jobs with a Class A CDL. Where I live in SW Ohio road paving season is ramping up and operators are desperate for drivers and those jobs can gross will over $1200 week and you are home every day. Class B tri-axle dump trucks have the same engines, transmissions and brakes as a semi. You will gain valuable experience and make a good income. If you have a clean driving record and can get through a test ride without breaking anything most companies will give you a shot. During the summer you will work very long hours but you will be home. Also school bus drivers are in high demand. Most districts around me are so desperate that they hire with no experience and pay you to go through training for a Class C with air brake endorsement. A year of experience safely operating a 66 passenger bus will open a lot of opportunities for upgrading. These options may not be as "glamorous" as cruising the country in a big shiny freight hauler but they are achievable and most likely can done within a few miles of home. Once you prove that you can efficiently operate a large, expensive piece of equipment without damaging it or harming anyone you have put yourself in a very marketable position. 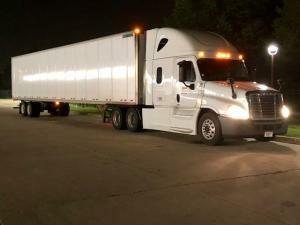 Any veteran drivers get your CDL "on the job"? Glad to see this topic come up. I am actually planning to start down this very path. I drove both class A and B trucks back in the late 80s while in college and grad school for my family’s gravel quarry and construction business. Mainly dump trucks but a lot of construction trailer, dumps and lowboy equipment drags as well. This was all pre CDL and I was out working in the business world when the CDL came around and did not bother to grandfather in. Now almost 30 years later I just turned 55 and after 27 years with my current employer I have accepted a pretty sweet voluntary buyout. My last day of work will be June 30 and I will receive a nice lump sum and will continue to get paychecks and insurance for 14 months. I would have no trouble getting another similar job but I am kind of tired of being cooped up in an office cube. The family business still exists so sometime in July, I am going to start helping out my cousin at his gravel plant. Initially I will just be running CAT loaders and off road haul trucks until I brush the rust off. I have been studying for my permit and will take the test this summer since it is only good for 6 months. At some point I will start running some loads with their drivers and will schedule the road test when I feel ready. Assuming I pass and get the CDL I will then start doing whatever driving they need me to do. They only have a couple tractors currently but in the winter they do lease them out for some flatbed work as well as local inter-modal drop and hooks. This will all be local class A & B work with no logging required but I plan to keep a personal daily record of miles, loads etc. Do that for a year or so and I am pretty sure that I could talk my way into something else if I wanted to. Not sure where it will go from there. I may discover that while the 25 year old me may have enjoyed bouncing around in a truck all day, the 55 year old me, not so much. I actually discovered this site when I first started considering this plan and could not believe all the good information that is available. Growing up around trucks and heavy equipment I am so impressed with the folks on this site that have went from never even being in a truck to out earning a living in such short periods of time. Just shows with dedication and hard work anything is possible. Perspective: How Important Are Truck Drivers To Easter In America? The ltl business shut down less than a year after I started in the mid 80s. A lot shut down around then due to deregulation. Funny thing was that I grew up around my family's trucking business and had been driving class b dump trucks, pulling low boys and dump trailers since before I was 18. Had the old pre-cdl Ohio chauffeurs license. First weekend they had one of the yard guys take the "college kid" out and show him how to hook up a trailer. He asked me if I wanted to try and drive. I played dumb and said sure. We get into a GMC Brigadier with a 10 speed and take off down the access road to where the loaded vans were. I take off double clutching away and even popped the button and get it into 6th and I can see him looking at me funny out of the corner of my eye. He points out the trailer and when I lined it up perfectly without looking out the daycab window he knew he had been had and busted out laughing. We probably had about 200 drivers at that terminal and within 24 hours they all had heard the story. My first job out of college was as a line haul dispatcher at a long gone ltl company, McLean Trucking. One of our customers made the plastic "Easter Grass" that you put in the kids baskets.They would compress it some but a full trailer would still barely move the scale. Wow...one of the original common carrier pioneers of intermodal and a couple of related spin-offs if memory serves me correctly. Back to Easter...one of the many eating holidays that creates an intensity of workload for grocery drivers and an opportunity to make some very healthy paychecks. Nothing like the month leading up to Christmas and New Years, none the less, I'll take it though.